• THE tragic death of a retired civil servant in the Belsize Park area (New Journal page 1 story, May 9) has again highlighted the significance of the local fire station under the threat of closure. I can but echo the words of an anonymous local witness to the Parkhill Walk blaze in opposing the proposed scrapping of this vital community asset. The evidence for the case against the closure of Belsize and 11 other fire stations across London continues to mount and to a large extent has emerged from the London Fire Brigade’s detailed analysis of the so-called fire safety plan for the capital initially reported in the previous week’s edition. At present fire provision fails to meet the current target of a six-minute response time in only one of Camden’s 18 wards. But if the cuts go ahead, then another six wards would see projected response times exceed the critical six-minute figure beyond which the risk to life and property increases dramatically. In the case of Belsize ward response times would shoot up by three minutes and 22 seconds, meaning that the area would have the longest wait for the first crew to arrive of any inner-London ward at just under eight minutes. Combined with the threat to shut Clerkenwell station in Rosebery Avenue, which deals with a high proportions of calls from south of Euston Road, Camden’s residents and the tens of thousands who work in the borough each day face a far less secure future unless we combine to halt Boris Johnson’s plans. In the context of a larger and more densely concentrated population in a borough with more than 40 high-rise residential buildings, there is a real cause for alarm. I strongly urge both fellow trade unionists and local residents to join the march called by the Fire Brigades Union for Saturday May 25, assembling from 11.30am at Oriel Place, NW3 in defence of the Belsize station. The upcoming consultation meetings at Islington Town Hall on May 28 and the London Irish Centre on May 30 offer further chances to illustrate the strength of opposition to these proposals. Rarely have the interests of public sector workers and the general public so clearly coincided. 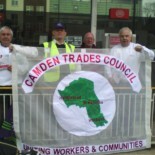 This entry was posted on May 17, 2013 by CAMDEN TRADES COUNCIL.